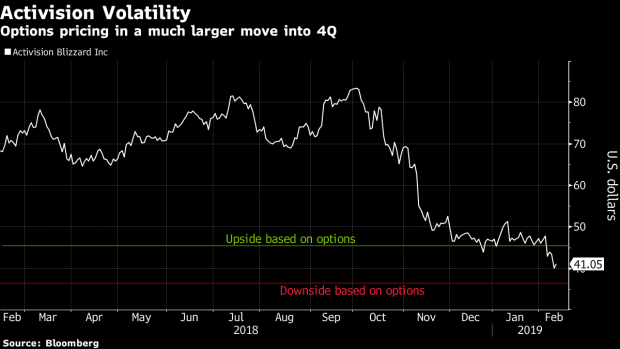 (Bloomberg) -- With Activision Blizzard trading more than 50 percent below October’s record high heading into its earnings report, options traders appear to be positioning for more volatility around the pending results, especially after the video game maker dropped 7 percent on Monday. Options prices imply a 10.8 percent change in the share price following the company’s fourth-quarter report, due to be released after the close of trading on Tuesday. That’s almost double the average move of 5.9 percent following the last eight releases, when declines outpaced rallies 5 to 3. Activision rose as much as 3.3 percent to $41.44 on Tuesday as Electronic Arts jumped as much as 9.7 percent and the broader market reached its highest since the first week of December. About 46 percent of Activision Blizzard’s total options open interest is set to expire on February 15, with calls outweighing puts by 68 percent which, on the surface, indicates more bullish positioning into today’s report. In addition to the high open interest, current implied volatility is elevated at 132 percent versus a 3-month average of 57 percent.